Kitty cats, in the left corner feast your eyes on Calvin Klein’s ravishing Ruffle Trim Chiffon Dress; in the right prepare yourself to fall head over heels for Lush’s charming ‘Crystal’ Pleat Dress. Though the Lush lovely sports pleating along the bodice, and lacks the ruffles upon the shoulders; for a mere $48.00, as opposed to the $158.00 needed to scoop up Calvin’s chic offering, it is just as capable of making one feel like a Greek goddess – whilst keeping the budget babe’s bank account intact! I like the way the CK one drapes so I think I would go with that one. $150 is not bad for an LBD that you are sure to get a lot of wear out of. I like the Lush one better. I really like LUSH better. I like the LUSH one... although they're super similar! So perfect for a summer cocktail party. these are two nice dresses, but the prettiest one is the ck one ;) it's stunning. I really like the Lush one. I like the pleated designs on it. i'd have to splurge and go for calvin klein, it's stunning! I already own the Calvin Klein dress, but I don't really see much diff besides brand labels between thetwo! I was initially going to say CK, because it's not THAT pricey, but when I checked, I realized that the material was polyester (same as Lush). Considering that, the price of the CK seems a little steep for what it's made of, so I'd definitely go for the Lush! I actually like the Lush one more! I like the lush one more. It's a little girlier, and I like the tie it has. 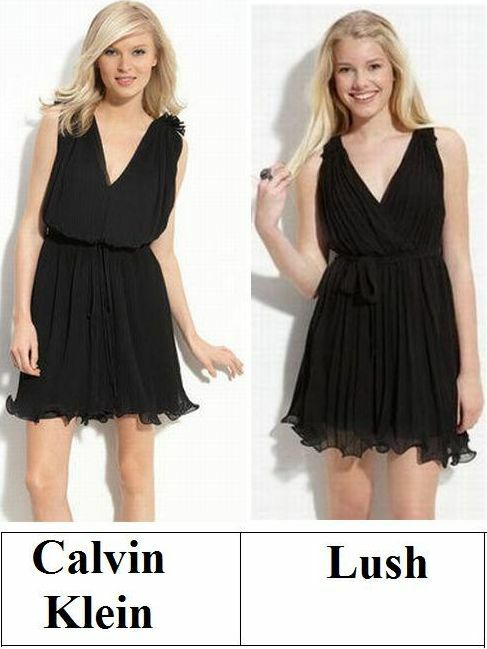 I like them both, but I would get the Lush dress. Oh, this is so perfect. LBD's are such an essential and these 2 look amazing. I love the Lush one: the pleats on it look gorgeous. Such a fab dress! Super gorgeous! Great blog!!! :) Happy Sunday to you! I so love this SUNDAY STEAL! Its so dressy. I think the lush one is prettier. Hope you had a wonderful weekend, Erika. So sweet. Love the LUSH dress. Gotta say the subtle detailing and lines of the CK drawn me in and it's still a great price! i like the cleaner finish of the calvin klein dress, but there's something fun and flirty about the lush dress. I love the more floaty Calvin Klein shape... So pretty. calvin klein all the way! I love that cut so much! both are gorgeous - i like the idea of Calvin Klein but both are very beautiful! I love the Lush dress a lot more. I love the sophisticated draping of the CK dress! Though the Lulu dress is a great alternative! Both are chic. Black and ruffles never fail 'chez moi'. Although both dresses look fab, I'm leaning more towards the Calvin Klein number.. An LBD goes a long way, so the price tag isn't too hefty. Hope you're doing great Erika! i actually really adore the fit of the calvin dress! I prefer the Lush version! It looks more flattering, especially with the tie at the waist. $159.00 is not bad at all for CK LBD. But, I'm with a lot of people. I actually think the Lush one is more flattering -- at least from what I can see in the pictures.